The word music in India means 'Sangeeta', which traditionally meant performing the art of singing, playing of instruments and dancing. Indian classical music originated from Vedic chants or Sama music. This music chiefly consisted of chanting of hymns in praise of the Vedic gods. The musical structure of the chants was characterised by descending order of notes, initially two to five which later was increased to seven notes. Gradually various developments took place and this culminated in the Raga tradition. The Raga (structure of melody) and Tala (structure of rhythm) are the two major characteristics of Indian Classical music. The melody deals with the rise and fall of sounds and the latter deals with the pattern of time beats of Ragas. Tala is the pulse of Indian music. The term Tala is derived from the Sanskrit word 'Tal' which means to strike with palms. Early musicians may have employed claps or palm-strokes to mark time in dance and music which later developed into a complicated system of 108 talas of classical music. It is a time cycle that remains fixed through out a particular rendering. Tala, binds music together and offer a regularity that calms the mind. Raga is the basic scale or note-pattern of a melody formed by selecting notes from the thirteen tonal intervals, conventionally established in the octave space. The notes are selected from ascending as well as descending progressions. They are Sa, Re, Ga, Ma, Pa, Dha, Ni in the ascending order and Sa, Ni, Dha, Pa, Ma, Ga, Re, Sa in the descending order. Frameworks, thus provided by the selected notes function as the ground-plan. Musicians can elaborate Ragas on the basis of this plan and create more tonal patterns pleasing to the ears of the listeners. Ragas in the South mostly have Sanskrit names, unlike in the North, where their names often comes from specific region or from the dialects of regions. Tala and raga varies in each composition. Sometimes Tala is more active and controls the other or vise versa. This depends on the person performing the music. Music is a universal art. The two cultures of the south and the north gave rise to the two modes of singing-Uttaradi and Dakshinadi or Hindustani and Karnatic. North Indian Music offers a variety of forms of music like the Dhruvapada, Khyal, Thumari, Tappa and Ghazal. The dhruvapada is a strictly classical and a slow form. The khyal incorporates into this rigidity, the romanticism of yet another form, the thumari. All these forms follow the same basic tenets of the raga-tala system. The thumari is used quite extensively to accompany the dance Kathak. This is because it incorporates a high degree of emotional and aesthetic content, from the bottom of the heart. The tappa is a lighter form of classical music that is brisk and replete with a variety of phrases, which makes it particularly difficult to render without a good degree of virtuosity. North Indian music has a wide range of ancient and beautiful instruments, each having a tone quite unique. Some of the more well known are the sitar, the sarod, the rudraveena, the santoor, the flute, the shehnai and the sarangi. Among the percussion instruments are the tabla and the pakhawaj. The tabla is used as an accompaniment to most music recitals. The pakhawaj has a deeper tone than the tabla. Karnatic music has a deeper understanding of 'notal' values and their inter-relations. The musician of the south adheres very firmly to the tala cycle. Karnatic music is rigid and deeply spiritual. Thus, taste for Karnatic music has to be cultivated. The dominant element of Karnatic music is the 'Kriti'; a form of composition with three parts. The literary content of the Kritis or songs, are in the form of offerings. 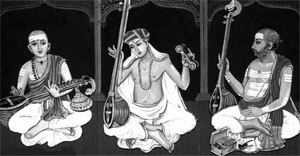 The three great composers known as the trinity of Karnatic music are Shyama Sastry, Thyagaraja and Muthuswamy Dikshitar. Tyagaraja is the most popular among them. The music compositions, 'Tyagaraja Gana', 'Valmikiya Kavana' and 'Agumbeya Astamaya' are said to be unique for enrapturing the human heart. The flute, the violin, the veena, the nadaswaram and the gottuvadyam are among the most well known South Indian instruments.